How I love. 🙂 Versatile, colorful, and makes me want to assemble and eat right now! And hooray for bringing salads to Thanksgiving- I’m totally with you! Totally not surprised people want seconds of your salads or pretty much anything you make. Just be glad that I’m not at your Thanksgiving. I have this super fast metabolism and seem to be able to ingest 4000 calories in a matter of seconds. I think arugula at the Thanksgiving table is practically scandalous! So daring. But adventurous. Especially with that red onion. And lemon dressing. Love it when you push me out of my food comfort zone. Thanks Emily! Salad bringers unite. Thanksgiving salad is a weighty responsibility. It has to have some nutritional value, because it is a salad. It has to be beautiful and colorful, because it’s a celebration and there are already so many white dishes in Thanksgiving. 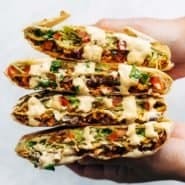 It has to appeal to the handful of people who may have special diets or who try to eat healthy all the time, and also to the people who will take a bite only to be polite. And it has to be delicious, because it’s competing with stuffing and cranberry sauce and mashed potatoes. This looks like it checks all the boxes. Power to the Thanksgiving salads! Yes, exactly!! Thanks for the comment Allyson! team salad (and dessert!!). there’s a mexican place nearby that puts fruit in everything (my enchiladas had papaya and mango on them last time), and while i twas definitely weird the first time, t’s growing on me. so i’m all for the mango! Ooooh yes please. That sounds like a dream. I am in charge of bringing a salad this year! I always to bring the dessert but my grandma makes the pies. Salad Bringer! Welcome to the club. This looks so delicious – wild rice is my favourite. Here in the UK we generally don’t celebrate Thanksgiving, but this could give me a good excuse… I need to try this recipe! Good excuse indeed! Hope you enjoy Grace! 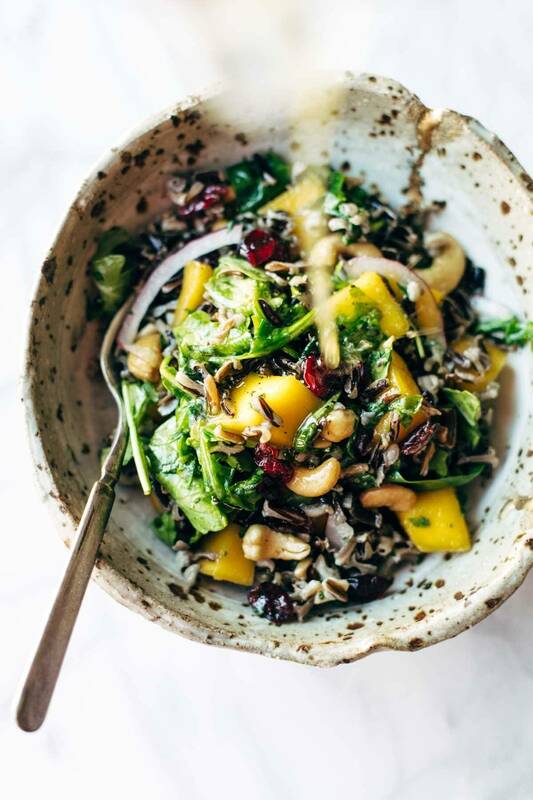 I’m on a wild rice binge right now, so this salad is right up my alley! Such a beautiful thing for the Thanksgiving table! I can totally see this layered in a Mason jar with leftover turkey and cranberry sauce. I’m all about practicing my Thanksgiving recipes these days so I I’ll have to try this one. You just blew my mind with that Karen. I LOVE that idea. Nice salad. I think we are all looking for different ideas for Thanksgiving. This would be a nice compliment to the traditional meal. This looks great! I love a good salad amongst all of the turkey, sides and bread. I will bookmark this for Christmas since Canada already has celebrated Thanksgiving. Right?! I’m sorry. I’m too late for Canada! I’m the dessert bringer in my family during the holidays but this salad is making me want to switch roles. Luckily I’m still at the point where I just get to go to dinner and eat – no cooking required 🙂 I would never be able to cook a turkey! Raw meat is so gross. Love that little dressing container you have!! I love it when a recipe comes with so many alternatives. There are already a few variations I would love to try. I am all about the flexibility here! Hope you like it Adina! Hahaha that quote! “mashed potatoes which are universally appealing whether you’re the three-year-old or the grandpa” so, so true. And mango in salads? Love it! Nothing weird about it. We don’t celebrate thanksgiving in Belgium but I will find an occasion to bring this on the table anyway, no problem. You can do it! 😉 Thanks Britt! This looks delicious and I am totally digging the jar lemon dressing, simple and classic! I hope your November has gotten off to a great start! LOVE when grains are mixed in a salad! This looks pretty and yummo! Thanks for your continued inspirational recipes! i am totally going to add some roasted shrimp to this for dinner! Yum! Love that idea, Lisa! allergic. mango=rash and itchy throat/ears… so that’ll need a swap. maybe pears. The first time I wrote to you a few years ago, we chatted about your time in the Philippines and my time in the Philippines (not expecting you to remember that, of course!). Now, my husband and I are back in the Philippines for 4 years–I have been sad about not being home for Thanksgiving this year (or any of the next 4 years to come!). But, now I cannot wait to make this salad since we actually have access to Philippine mangos! Yes! Cannot wait. Thanks for making me feel a little bit more in the mood for Thanksgiving by making a salad with mangos! This was such a great addition this year. I’ll be serving it next year, as well (and during the week for work lunches)! Thanks! Great! Glad to hear that, Michelle! I roasted some butternut squash for this instead of mango and the whole thing was delicious! 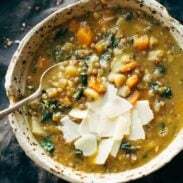 An awesome Meatless Monday recipe my husband and I loved.